Have a look at the purchase below. 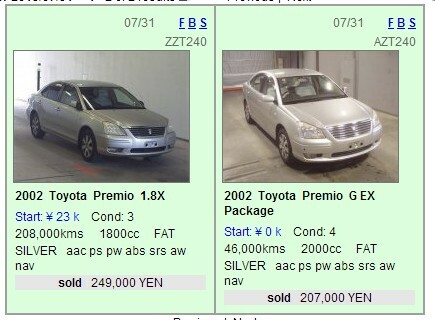 Two Toyota Premios, 2002 that sold in the Japan car auction yesterday. One sold for 207,000yen (about $2500 FOB), the cheaper one, and it had done 46,000kms. Nice car, wouldn’t mind driving it myself! Grade 4 and all! The other one, grade 3, 208,0000kms, the more expensive one! Yes, this one sold for 249,000yen (about $3000 FOB). Even if the price was halved I still wouldn’t want to buy this one. Imagine all the worn out parts that need replacing soon! So what is the logic here? The worse a car is the more it sells for in the Japan car auctions? No, the logic is the exporters all thought this would be a good one for stock. To sell to Africa for example. They also thought the car with the highest kms, MUST sell for the cheapest price, so they all ignored the better cars and competed for the “cheap one”. The end result is, the “cheap one” became the “expensive one”. Now your challenge! Find this car on someones stock page somewhere. 2002 Toyota Premio. With a bit of fancy plug in computer work, I bet you the kms will be different!